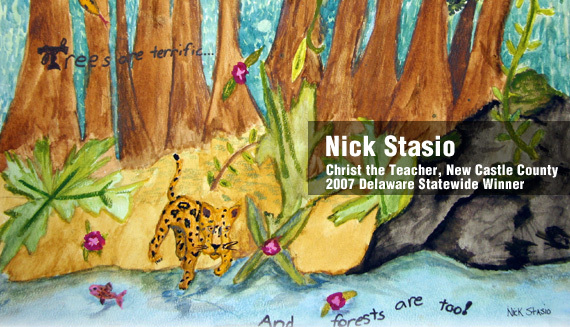 Nick Stasio of Christ the Teacher was the 2007 State Winner of the Arbor Day School Poster Contest. “Trees are terrific… and forests are too!” is the 2007 theme, designed to increase knowledge about trees and forests and the many benefits they provide. The annual school poster contest is open to all K-5 public, private, and charter schools as well as other organized youth groups and after-school programs. The annual Arbor Day Poster Contest helps teach students about forests and forest resources. Participating in the poster contest is a way to learn more about the role of trees in our state and their direct impact on the health and well-being of Delaware residents.